Product prices and availability are accurate as of 2019-04-22 17:00:35 BST and are subject to change. Any price and availability information displayed on http://www.amazon.com/ at the time of purchase will apply to the purchase of this product. Bellini, a premium Franklin Brass Collection, with intricate detailing and design inspired by the rustic charm of European artisan villages, gives your bathroom that updated, refreshed look with coordinating 18"and 24" towel bar, robe hook, towel ring, and toilet paper holder options, and is available in a Polished Chrome and White finish. The traditional styling of this product displays class and endures through time. 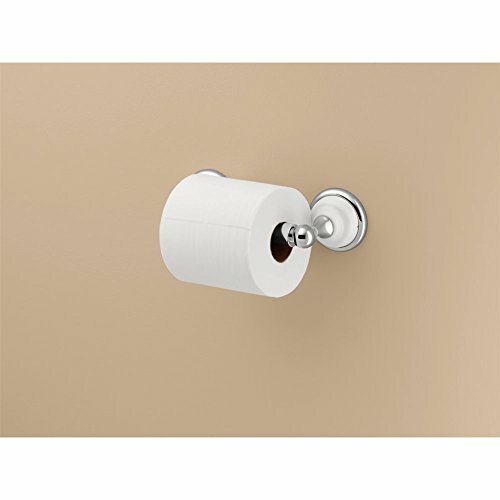 This toilet paper holder has everyday usefulness in a classic polished chrome and white. Zinc die cast construction ensures strength and backed by a limited lifetime manufacturer's warranty. Installation Instructions and hardware included.